Recently the Ten Squared Women of Guthrie County presented their latest quarterly donation of $11,300 to the City of Yale for their park and playground renovation project. The donation will allow the City to add playground equipment that is age appropriate for younger children and make upgrades to existing equipment and the shelter house. It will also allow them to furnish additional picnic tables and purchase a new grill and water fountain. This will be the first large scale renovation to the park in over 20 years. The other two nominated organizations were the Guthrie County Public Libraries and 3 C’s Panora. 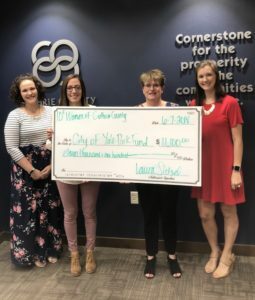 The Ten Squared Women of Guthrie County have donated about $65,000 since starting in 2017. Their next quarterly meeting will be Thursday at Lake Panorama National Resort and Conference Center with a light meal at 5:30pm followed by the meeting at 6. The Ten Squared Men of Guthrie County also made their most recent quarterly selection on Tuesday. They chose to make a donation to the Bayard Fire Department for equipment and facility upgrades. The other two nominated organizations were the Panora Downtown Enhancement Committee and the Guthrie County Historical Village and Museum.